Dr Florian Krampe is a Researcher in SIPRI's Climate Change and Risk Project. 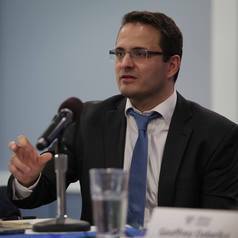 He specializes in peace and conflict research, international relations and political ecology. His primary academic interest is the foundations of peace and security, especially the processes of building peace after armed conflict. Currently, he focuses on climate security and the post-conflict management of natural resources with a specific interest in the ecological foundations for a socially, economically and politically resilient peace. Dr Krampe is an Affiliated Researcher at the Research School for International Water Cooperation at the Department of Peace and Conflict Research at Uppsala University and the UNESCO Centre on International Water Cooperation hosted by the Stockholm International Water Institute (SIWI).